photo by unspecified Strauss family member, 1955. ﻿﻿Dave has been a photographer since 1955. For proof, we offer this photo. 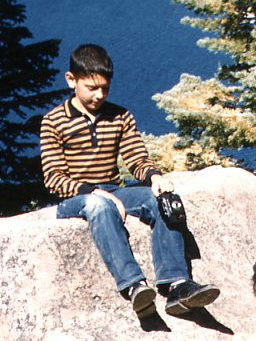 He is sitting on a big rock beside an unspecified lake at about the age of seven, with a Kodak Brownie camera dangling from a strap around his wrist. This historic image was discovered in an old metal hinge-top candy box along with many other poorly exposed and out-of-focus travel photos. There were images of two-lane roadways receding into dusty red rock canyons, a parked Ford station wagon with modest tail fins, puzzled children, each shading his/her eyes from the sun with one hand while waving vacantly with the other, and, three state border signs, all with bullet holes, that say, respectively, “Welcome to Utah”, “Welcome to Nevada”, and, most prized by collectors, “Welcome to Idaho”. The youngest of three children, Dave enjoyed more freedom than most and often wandered around the woods adjacent to then quiet and modest San Rafael in Marin County, CA. He was fascinated by bugs, snakes, trees, squirrels, rabbits, spiders, and lizards, so he watched them carefully during his solo expeditions, and occasionally caught a spider, a lizard, or a snake and brought it home. The unlucky creature would be remanded to a box or a jar along with some weeds, sticks, dirt, and the very best intentions. Snakes and lizards, assigned to a Genuine US Keds shoe box, often escaped into the random junk on the floor of ﻿Dave’s closet. In high school, Dave took what he thought of as ARTY pictures of his friends with a twin lens reflex and flash-bulbs. Meanwhile, across the Richmond Bridge, his enterprising older brother Phil ran a small photo business from his dorm room at UC Berkeley and hired Dave to take souvenir pictures of inebriated couples who posed on a hay bale or some other corny backdrop at periodic undergrad bacchanalia quaintly known as “dances”. These events were Dave’s first experiences as a paid photographer, and an excellent opportunity to observe, at close range, many absorbing details of college life. So it was no surprise that Dave would follow his brother and sister to the University of California at Berkeley in 1966. Like most directionless freshmen, Dave considered many majors -- actually, all of them. Although the General Catalog was a very thick book, he carefully analyzed every page and briefly considered his brother’s major, Electrical Engineering. No doubt that would have been a fine choice, leading to a fascinating and lucrative career. However, "EE" mandated a daunting burden of math, physics, chemistry, and other classes that required, well, STUDY, so he eventually chose art and design. Dave surmised, correctly, that ﻿self-expression ﻿would be a gentler path to graduation than actual subject matter. 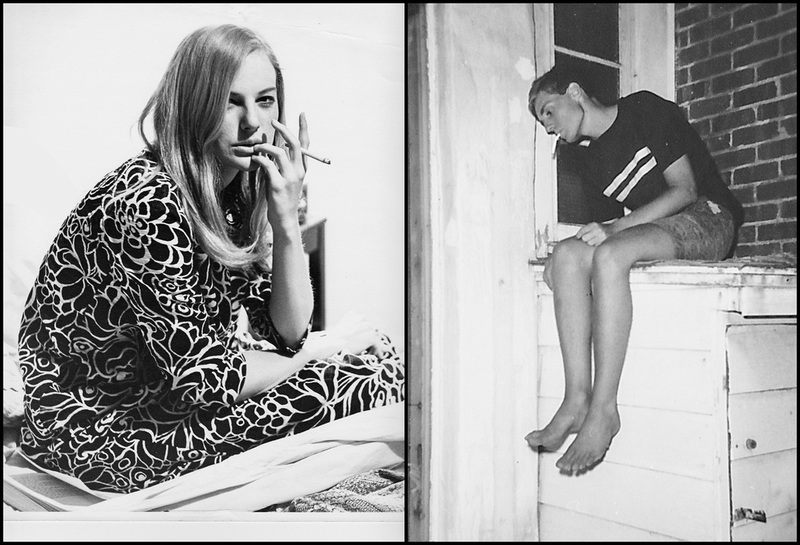 UC Berkeley from '66-'70 was an excellent place to spend one's transitional years. Tumultuous political and cultural events flowed in a dizzying, non-stop torrent. It was a disturbing, exciting, and illuminating period. MEANWHILE, and speaking of illumination, photography consumed rapidly increasing DS mindshare. Dave acquired three cameras: a Yashika MAT medium format twin lens reflex, a Miranda 35mm single lens reflex, and a Speed Graphic view camera. He shot hundreds of rolls and hundreds of sheets of film, spent uncountable hours in the Wurster Hall darkrooms, learned to blow glass, dressed very strangely, welded, painted, sculpted, studied photography, acquired and restored old motorcycles, and began to be drawn toward the idea of being an ARTIST. OK, but who’s to say he wasn’t? Even being a POSEUR was attractive, considering it was a French word. He got occasional gigs doing event photography, most memorably photographing the notorious Bruno Bettelheim for the University of Chicago, where he was faculty at the time. He even photographed a friend who was becoming a fashion model and needed some pictures for her portfolio. Dave left school for about 6 months during '68-'69 to travel in what turned out to be a trip around the world. On the way, he shot dozens of rolls of film, mostly Ektachrome slides, capturing images in countries no longer accessible for casual tourist travel, including Iran, Afgfanistan, and Pakistan. The image to the right shows the boys drinking their morning coffee at a campsite beside the "road" (at that time mostly a punishing dirt track from border to border) in the south of Afghanistan. 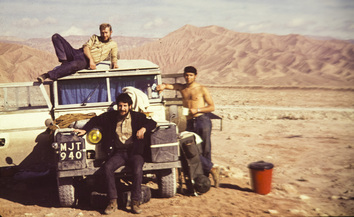 Dave met Ian and Phil in Tehran and traveled with them in their Land Rover, sharing expenses, all the way to Kathmandu, where they sold the car. It took about 6 weeks to get there from Tehran. The trip was amazing photographically and otherwise. 1968 tripod-selfie showing Dave, shirtless at right, with British travel pals Ian and Phil. A serendipitous job opportunity after graduation led to training as a computer programmer and decades of subsequent work in high tech as a software designer and later as an executive at companies ranging from Silicon Valley venture-funded startups to Fortune-500 companies such as Litton Industries, Lucent Technologies, and Motorola. For Dave, photography necessarily faded, but persisted in the background for many years. Fast-forward to the Millennium, year 2000, "Y2K", the year when all civilization was expected to collapse because programmers during the 70s (including Dave himself, then working as a programmer at the Bank of America computer center) didn't provide for 4-digit years in their programs and file structures. (e.g., 1972 was stored as '72', not '1972') Who knew that these programs would still be running 25-30 years after they were written? The dire forecast: all banks, insurance companies, utilities, hospitals, government agencies, wholesalers, retailers, butchers, bakers, and candlestick makers would collapse at 12:00:01 AM on 01-01-2000 in an apocalyptic white-hot lava flow of zeros and ones as the computers of the world erupted in a cataclysm of logical frustration, unable to compute the date rollover from '99 to '00. In fact most institutions were well prepared and nothing much happened. With all the benefits of digital (e.g., no film or chemical costs, instantaneous viewing of results), Dave started taking more pictures and steadily upgrading his cameras, lenses, and other photo equipment. In 2008, he bought a Canon Digital SLR, sold his last remaining film SLR (bye-bye, no regrets), and was on his way to becoming a hard-core photographer once again after a long hiatus. Today, Dave is a photographer specializing in studio portraits, editorial photography, tabletop/macro, wildlife, and scientific images. He is also a graphic designer and publisher of his images in a variety of formats. His photographs are shown in individual and group exhibitions, and published in general circulation magazines, academic journals, books, and websites.